Tunbridge is a gorgeous little fairgrounds. Little is the key word here. 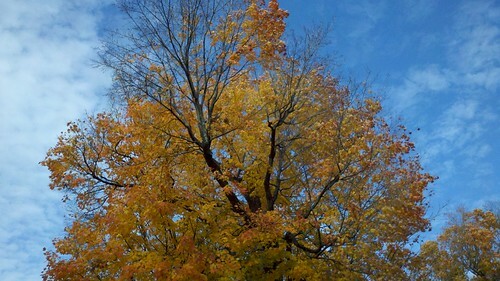 In spite of being almost exactly 40 weeks pregnant I was able to walk the whole fairgrounds. Granted we took plenty of sitting breaks. I joked that I was eating and peeing my way through the festival. I’m so classy, see what you’re missing by not being around me all the time? 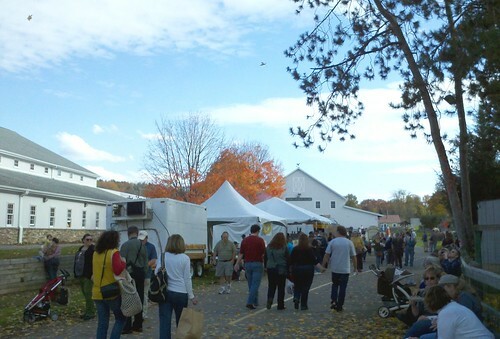 There were maple creemees (soft serve, to those of you not in Vermont) and maple shakes while watching the sheep dogs. I met lots of friends (reinforcing Neil’s opinion that I must be knitting-famous) and chatted with many of my favorite vendors (the lines here are blurry) but I took NO pictures of people. Oops. I got some yarn (shocker!) 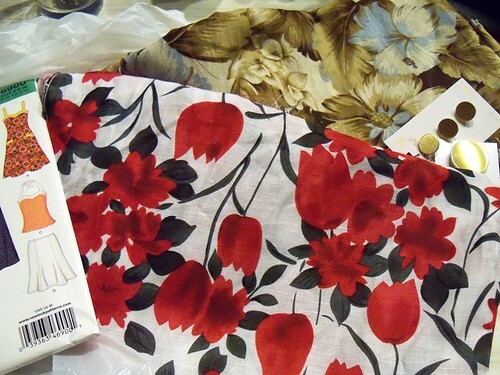 and some new project bags, and no fiber. 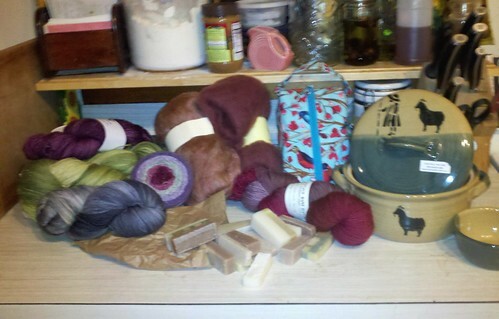 The fiber stash I have already makes me sad that I don’t spin more. But trust me, I oogled plenty of fiber anyway! 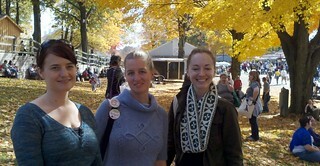 Last weekend I went down to the VT sheep and wool festival with some friends. 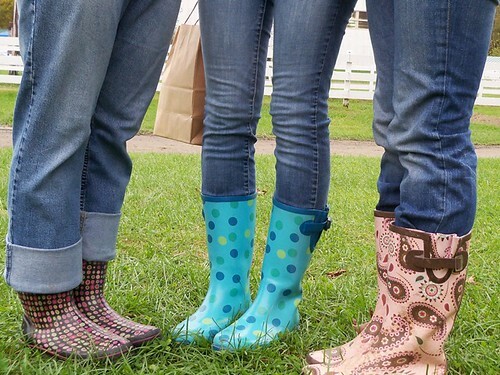 It was a muddy weekend, but we had a good time anyway! We went to introduce one friend to the festival atmosphere. 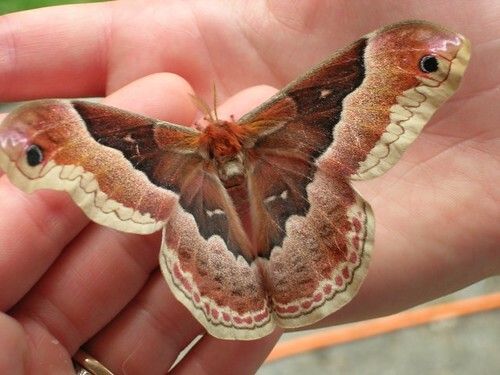 She’s coming to Rhinebeck in (nine!!) 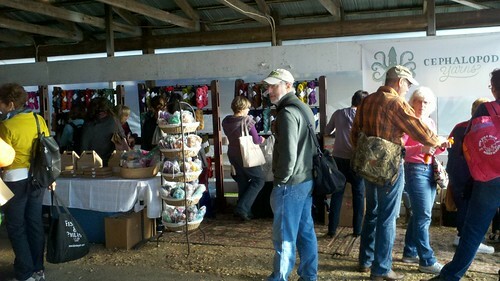 days and had never been to a fiber festival before. We wanted to start small. 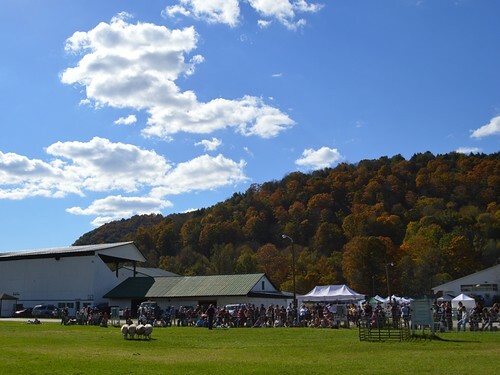 We saw the sheep dog herding trials, watched a sheep get sheared, met other bloggers and some twitter friends, and generally had a good time! 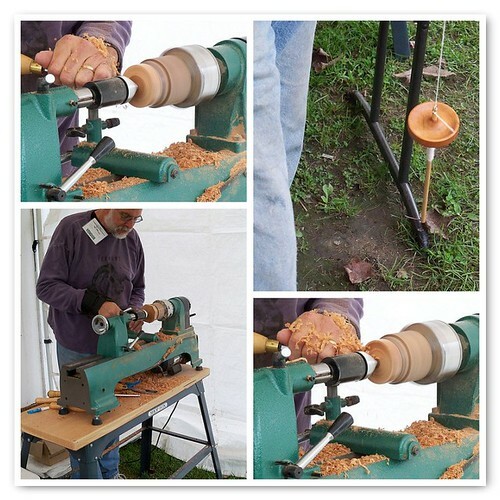 I loved watching the guy from Yellow Dog Farm who was making spindles on site. He went from an octagon of wood, to a beautiful, functional spindle right before our eyes. These batts are what happens when I’m turned loose with a drum carder and a full spectrum of colors (plus white and brown) I’m pretty pleased with this assortment, although each batt is only 1-2 ounces so who knows what’ll happen with them once their spun up. 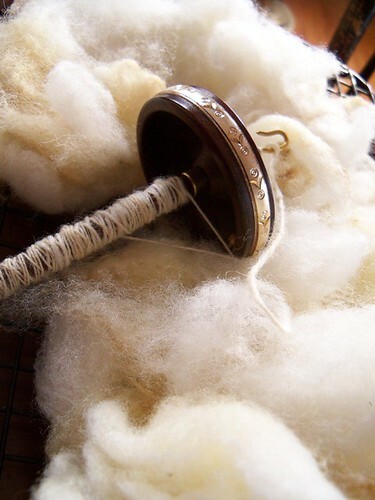 Speaking of spinning I’m doing the Tour de Fleece next month. This is where spinners set goals and spin every day – theoretically while watching bikers spin in the Tour de France. Since I’ve NEVER watch the real tour I’m clearly just in this for the camaraderie and the reason to try and spin every day. If you’re on Ravelry the group is here. Sunday afternoon my friends Amy, Dana, and I did a little farm sight-seeing. 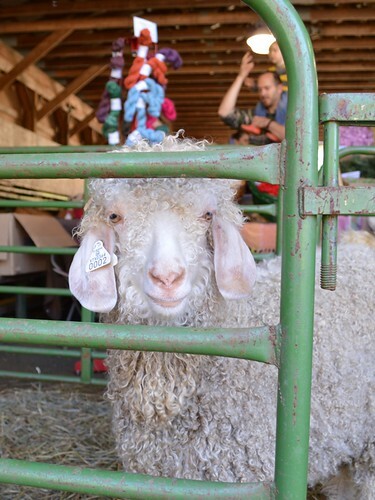 The Northeast Kingdom put on it’s annual Farm-to-Yarn tour and so we visited a few nearby farms. Is essentially kid silk haze on four legs! I thought, since I’ve spent the last few days talking about the joys of using a wide variety of yarn, I should make some recommendations. I don’t know if I can really say “I recommend” all of these since I haven’t even used some of them. But I can at least do a little leg work in case you’d like to try them. The tricky part here is that the breed distinctions are more often made in fiber then in wool, so many of these breeds I’ve used have been handspun. I’m trying to find actual yarns when possible, but I haven’t used them all. Also note I’m trying to link places that list skeins and prices online. But I’m not affiliated with any of these sites, and I have no information into availability, shipping, or anything else. I was going to leave Merino off because there are so many merino yarns available. 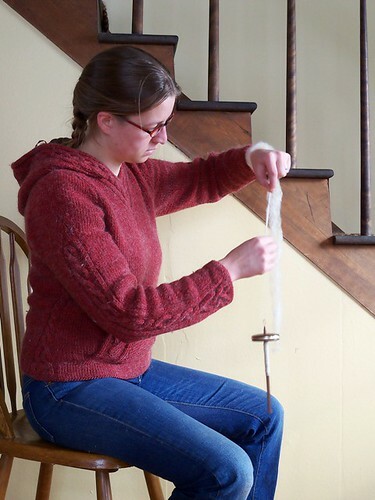 But I really love Beaverslide’s yarn because it’s not a highly processed merino. You may find a little veggie matter in this yarn, it has the same textured, farm-based look of many other favorites (like Bartlett) but it’s still buttery soft, because it is still merino. But this is a merino you can believe came off a sheep. 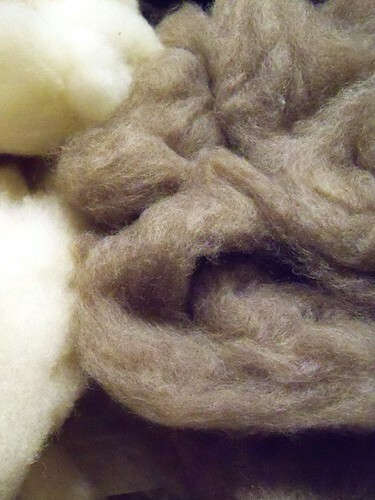 From what I understand the sheep are the cross, not the two fibers are blended to make the yarn. But I haven’t asked directly, so I could be wrong. I’ve talked briefly about shelter before, but I’ll say it again. 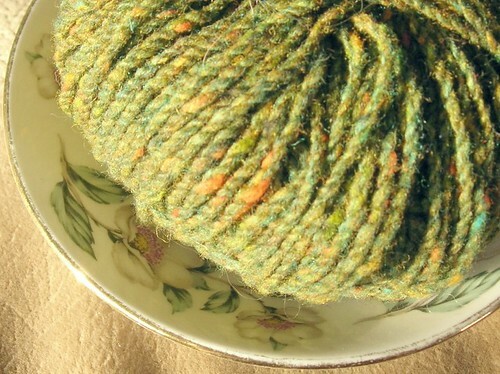 It’s very lofty and fluffy you can feel a crispness to this wool yarn. It’s good for trapping air and nice textured knits. I find it softer then basics like Cascade 220, but not nearly as soft as merino. This one may not be unknown to knitters. 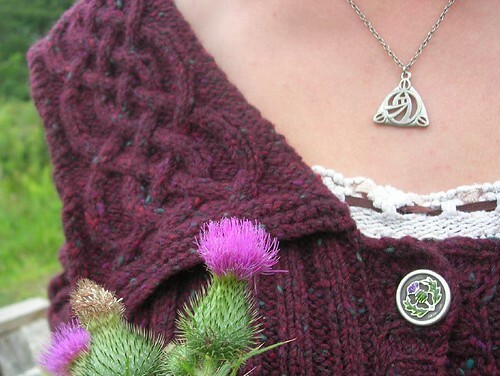 Shetland is sold to knitters for fair isle projects because of it’s sticky properties. I’ve used Jamison’s from England as well as Harrisville’s yarns, I like this one because I’ve visited them mill. I describe shetland as sticky and woolly but not scratchy. It’ll probably depend on how sensitive you are. Another one that many knitters are probably familiar with. Icelandic sheep are a very old breed and even I’ll admit their fibers are a little scratchy. BUT it makes the best outer layers you can imagine. That Targhee fiber may be soft but there’s no way it’ll cut the wind. I can picture wearing a sweater of icelandic yarn INSTEAD of a coat. It’s warm and thick and protective. Sometimes you need that. 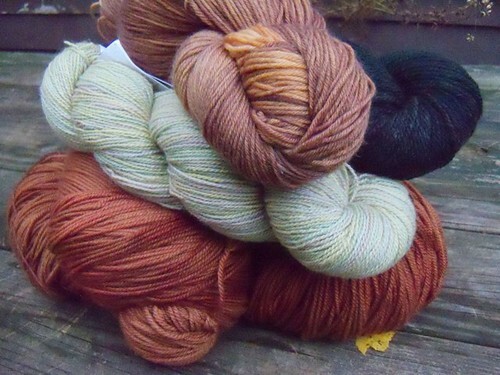 I haven’t used yarn from THIS coopworth farm, but I’m linking them because they have skeins and prices online. My pink and brown hat and mitten set is done in 100% coopworth from a Vermont farm (that doesn’t have a website) and I absolutely LOVE them. The scratchy level is right around shetland yarn which doesn’t really bother me. The mittens are so dense they keep my hands toasty warm even when the temps drop below zero – and I’ve had several opportunities to test them this winter! Like the icelandic yarns they make nice, durable outer-wear but with less scratch. Again, not the wensleydale I’ve used. But looks like a good one to link. Wensleydale has long staple length and is very high gloss. So while it’s not the softest fiber it works wonderfully anywhere you want drape and shine – I think it’d be perfect for a shawl. Knitters may know this one too, it’s usually shortened to just BFL. 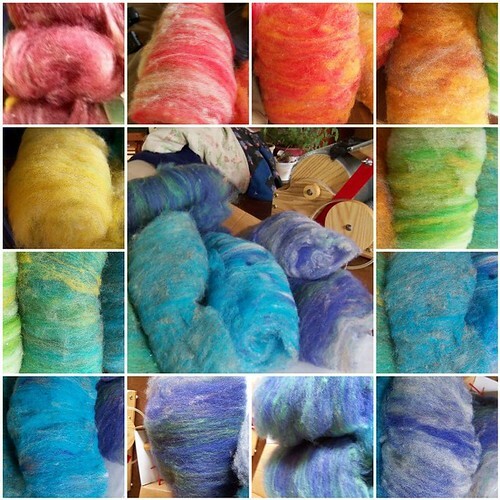 Fleece Artist has a number of BFL yarns in different weights. Almost as soft as merino but with a much longer staple length and higher luster BFL knits up into a fabric with much more drape. It should also pill less due to the longer fibers. 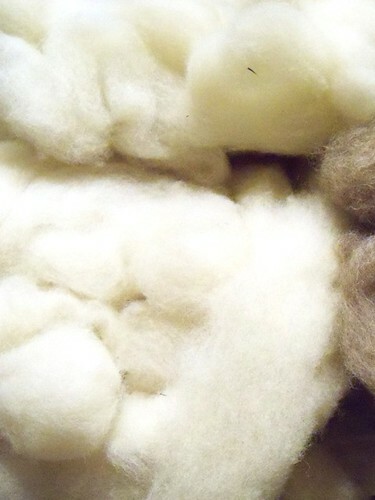 Cormo is a finewool: crimpy and soft like merino or Targhee. 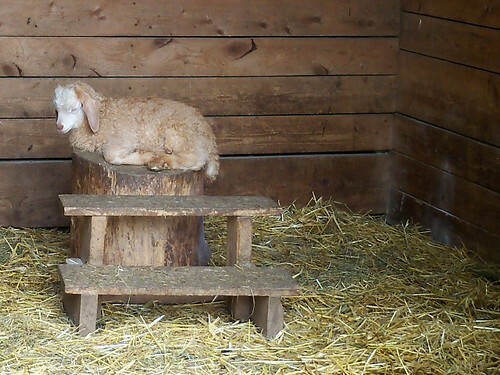 Navajo-Churro sheep, like icelandics, are a primitive breed. 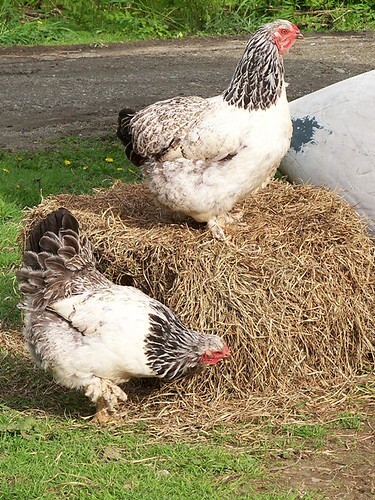 They have a dual coat and there’s a big difference in softness between the under and outer coat fibers. 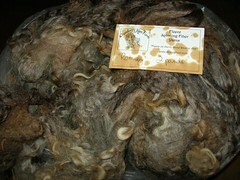 Romney wool is a longwool breed. 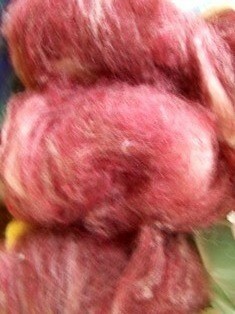 It’s fibers are incredibly crimpy, hold lots and lots of air, and add loft to any yarn they’re blended into. 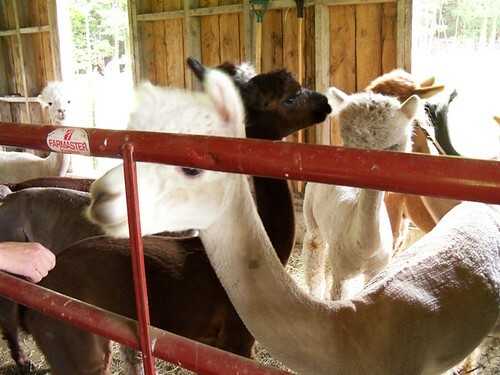 If you want to try more unusual breeds of yarn I really recommend Local Harvest. 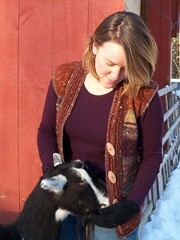 This site allows farms to market straight to consumers, think of it like etsy but for farmers (and you can find lots of goods besides wool there). 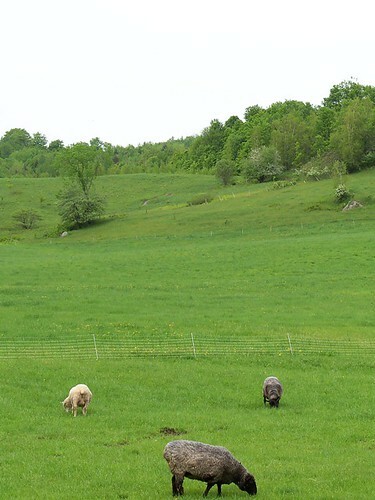 Ever heard of Clun Forest sheep? How about Perendale? Wondered what the straight mohair would be like in yarn? 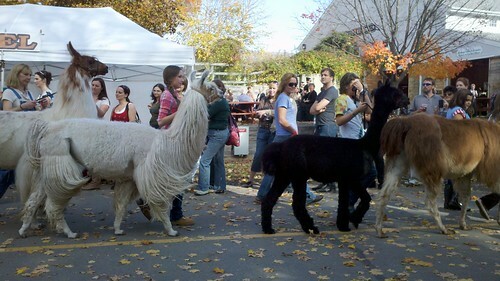 What do you suppose the fiber would be like if you crossed a shetland and lincoln sheep? If you want really in depth reviews, Knitter’s Review has a great selection of yarns they’ve reviewed. If you have used any of these. Or if you go out and find some, let me know what you think of them! 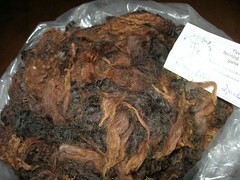 As for my Montadale fiber. I’ve spun up that little bit of washed fiber. It’s waiting to be plied with some purple fiber from a nearby sheep. Once finished it’ll be a single, marled, skein of truly vermont grown yarn. Imagine if all the wine in the world – red and white alike – were mixed together and sold as generic “wine.” Think of how many centuries of craftsmanship and flavor would be lost, and how mediocre it would taste compared with how it would taste if the grapes had been kept separate or selectively blended. Such an act would be almost unthinkable in the food world. 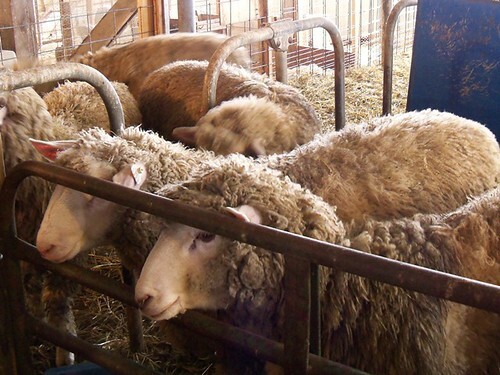 But in the knitting world, just as much nuance is lost every day when flat, bouncy, long, short, matte, and lustrous fibers from ancient and modern sheep breeds alike are bundled together and sold as generic “wool” yarn. I’m not a big collector of knitting books, but a friend loaned me this one. Now I’m going to have to go buy my own copy before I can give it back. I think it’s meant as a reference book mostly for looking up breeds of sheep, but I’m reading it cover-to-cover it’s so wonderful. 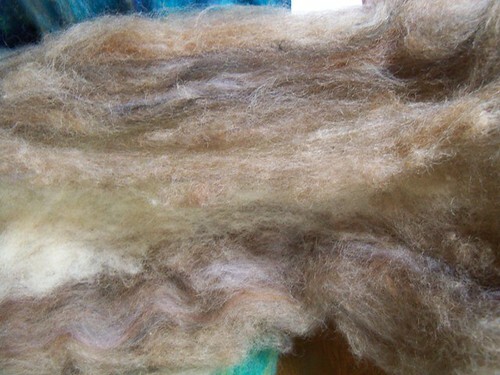 I’m really excited about my Montadale fleece, not the least of which reasons is because I can look it up and tell you that Montadales are a medium wool breed with fiber ranging from 24-31 microns (merino coming in at 17-22) a high crimp, medium luster, and suitable for next to skin and midrange garments. My big bag of wool is really REALLY full. 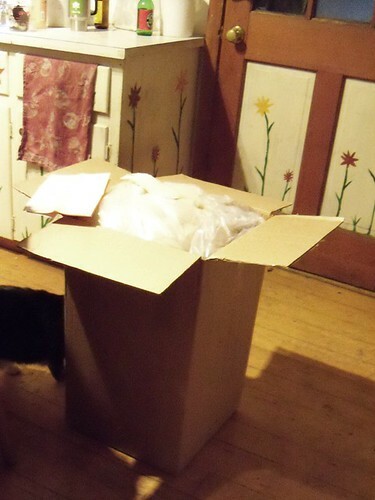 It was even several pounds heavier then Amy’s fleece. After we left the farm we headed back to her house, spread an old sheet on the floor (to protect the floor, not the fleeces) and sorted through our purchases. Since they’d only been minimally skirted we pulled out all the really dirty bits, the poopy bits, the hay, and the burdocks. I’m sending it off to be cleaned and carded this weekend and when it comes back we have plans for all sorts of dying and blending projects. Not wanting to wait in suspense I took a few of the cleanest locks and washed them up myself. Holding the cut ends I swished and washed them in several changes of hot, soapy, water* until it stopped turning brown. Then I set them in a pot of water on my stove keeping it at a low simmer to remove the rest of the grease and lanolin. The washed locks dried quickly by the stove revealing pure white fibers with just a touch of creaminess at the tips. I don’t have any carding equipment of my own. But it didn’t take any more effort then pre-drafting ever does to pull the locks out into long, thin strips and begin spinning. The feeling of going from sheep to spindle in less then 24 hours is hard to describe. 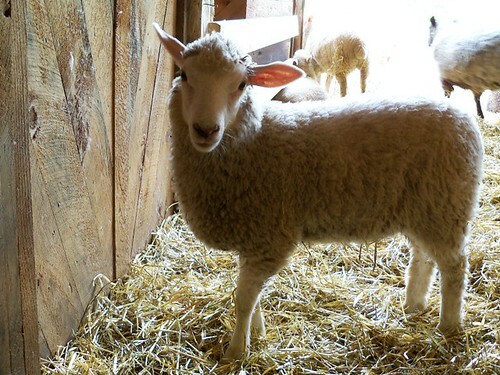 *neat fact: wool doesn’t felt as long as all the fibers are aligned just as they were on the sheep. So you can wash them more vigorously in lock form without worrying. 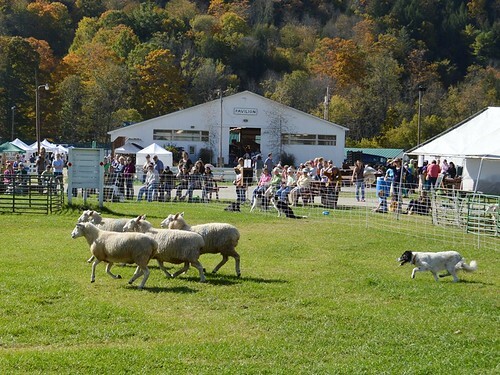 Last weekend Amy and I went to see a sheep shearing at a local farm. The farm we visited has been raising Montadale and Montadale/Coopworth cross sheep for meat and useful fleece for 30 years. 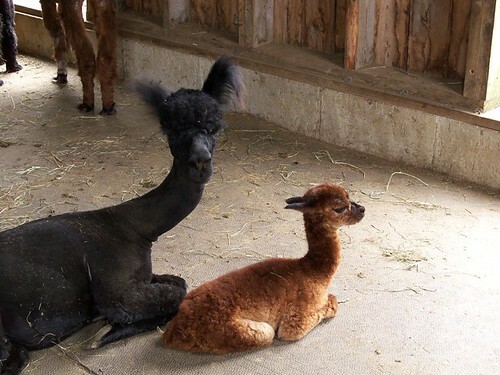 I find fuzzy sheep so appealing. Maybe someday I’ll get a few of my own. 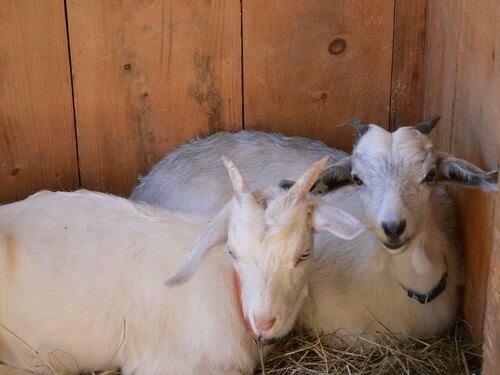 In the mean time visiting local farms is a lot of fun too. The shearer was amazing. 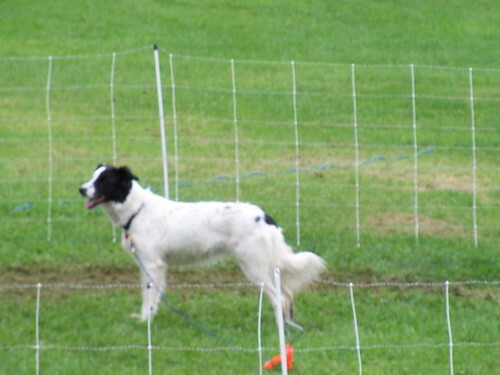 She worked quickly and efficiently, which was clearly best to keep the animals from getting too stressed. She’d sit them down on their rumps and start the shearing with their bellies. We didn’t see her nick any of the animals – although she did nick herself at one point. 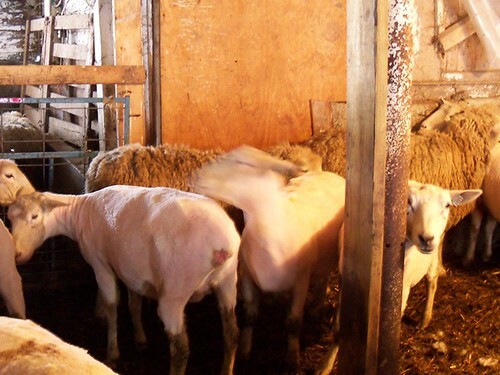 Once separated from their fleeces the sheep would hang out with their friends at the back of the holding pen. I’ve heard one problem with raising sheep is that the price farmers can get for the fleece doesn’t necessarily cover the cost to have them sheared. 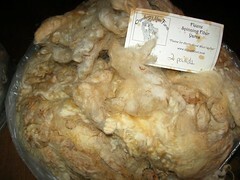 This farmer was inviting people in to see the process, and also selling fleeces – Entire Sheep Fleeces – for just $5 each. If no one claimed a fleece, it just went in the bin. Of course these are dual purpose sheep breeds. Neither is an extremely soft finewool like merino, however both Montadales and Coopworths have fleeces that are known to hand spinners. 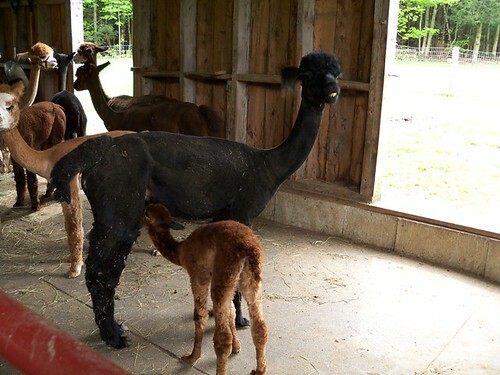 We’d agreed to go just for the fun of seeing a shearing on the farm. And you know, maybe, just maybe, check out the fleeces. 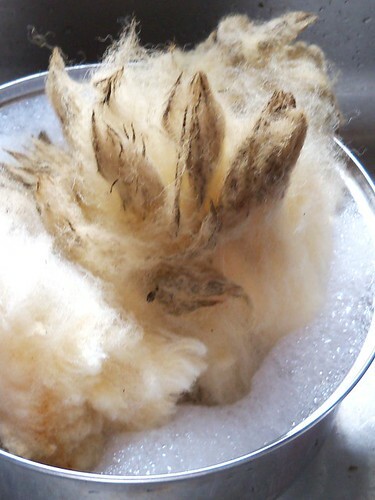 After all, the fleece of a meat sheep could be almost anything. 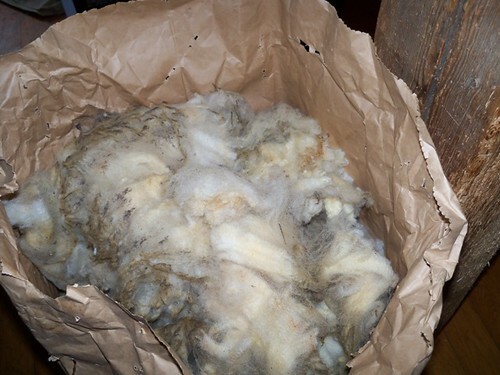 These sheep weren’t coated – meaning the fleeces are exposed to everything the sheep bumps into or lays down in… And just because a breed can have decent fleece fore spinning doesn’t mean the particular sheep in question will have a fleece anyone would want to spin. 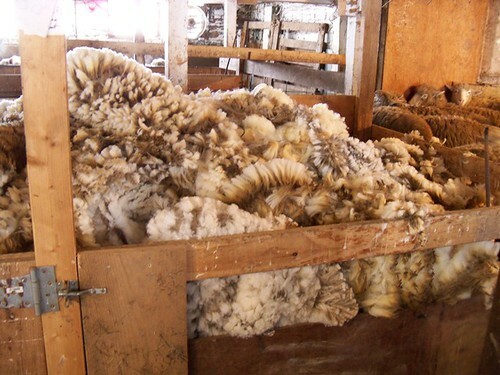 The diet and living conditions of a sheep can affect an individual fleece almost as much as the breed. You know where this is going, right? Of course I bought one. Finally a quick note. I have a guest blog post over at the Knit Purl Gurl talking about the design process for Root Cellar. You can also enter to win a free copy of the pattern, so pop on over and check it out!